Chris Hunt, a 6-1 177 pound CB from Virginia Beach, VA has verbaled to UMass. Article by Mike Traini of "Fight Massachusetts" about Hunt's verbaling to UMass. I've blogged about Hunt twice before. Hunt chose UMass over offers from Army, East Carolina, Navy and Charlotte. 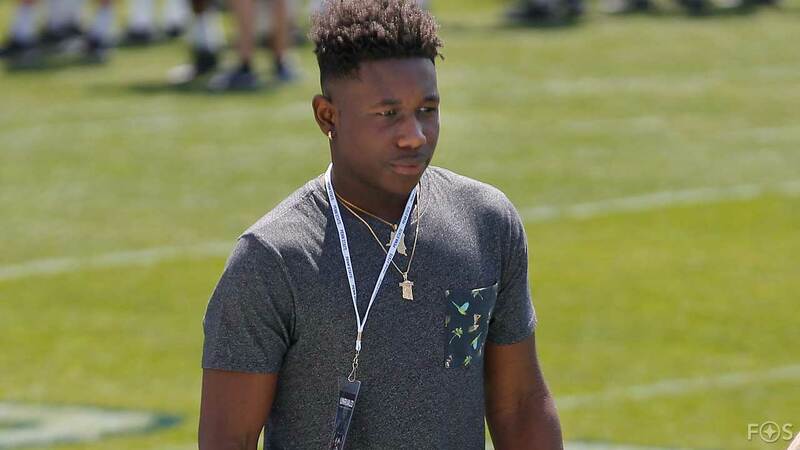 Hunt's verbal brings the Minutemen to five three-star recruits so far. Back On January 24th, 2017 I blogged about Claudin Cherelus, a 6-2 195 pound Safety verbaling to UMass. The Naples Daily News has a story featuring Cherelus and other Naples area players signing with various college teams. Xavier Steel, a 6-0 180 pound DB from Orange Lutherian has Tweeted he's verbaled to UMass. OC Varsity.com has a post on Steele's verbal to UMass and link to an article featuring Steele. Mike Traini of "Fight Massachusetts" has a post on what to expect in tomorrow's UMass Signing Day. SBNation has an aticle on how college football teams build their recruiting board. Numerous quotes from UMass coach Charles Walker. James Ihedigbo on playing through a broken leg: "I'll just tighten my shoe.". James Ihedigbo: "On why some outside of New England are rooting for the Patriots". Victor Cruz on the Giants WR's notorious Miami trip: "It definitely wasn't worth it.". 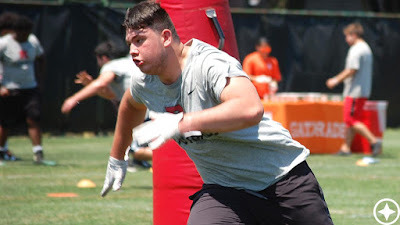 The Orlando Sentinel profiles Dylan Meeks, a 6-2 220 pound LB from Orlando, Fl, who after suffering a torn labrum in his senior season, has zero offers. 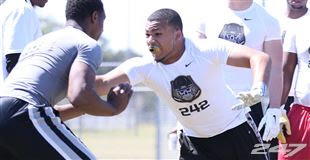 Meeks is a 247Sports three-star player and the #45 ranked linebacker recruit in the nation. 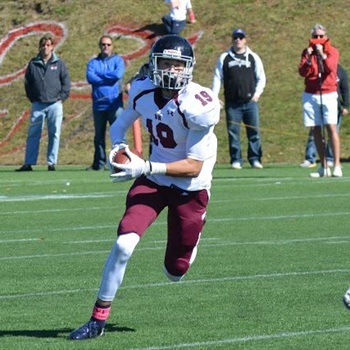 Jake Bobo, a 6-5 175 pound WR from Belmont, MA has Tweeted he's received an offer from UMass. Besides UMass, Bobo holds FBS offers from Army, BC, Wake Forest and Duke. Mike Traini of "Fight Massachusetts" has a post on some of the players making official visits this weekend. Two RB's in Mike's group. Suddenly, that's a position UMass needs to recruit. No RB's, CB's or special teams verbals so far. There's a 2017 version of the UMass Football Roster up. There'll be several more iterations before Spring is over. 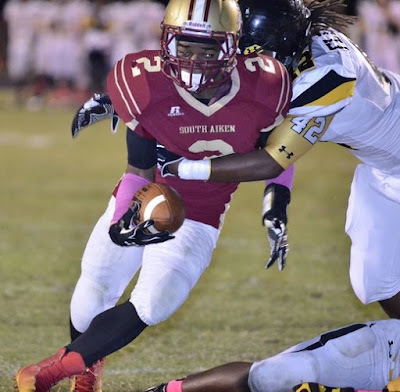 Sekai Lindsay RB- Lindsay was UMass's 2nd leading rusher going 33-156 4.7 AVE 1 TD 22 LONG. That leaves the Minutemen with only two scholarship RB's Marquis Young and Bilal Ally. Peytton Pickett RB. 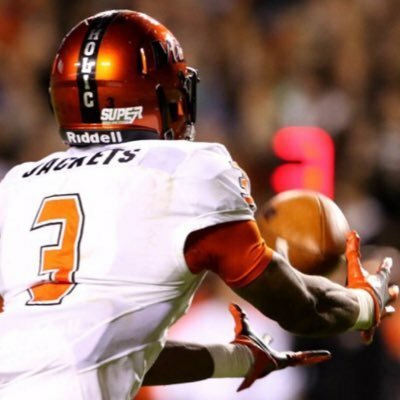 Pickett redshirted in 2016. Brandon Mangram CB. Mangram had already Tweeted he was leaving UMass. Cody Banks TE. Banks redshirted in 2016. The Berkshire Eagle has a post on UMass' 2017 schedule. A December signing period could reduce the drama of LOI Day. Recruits love hitting the buffet line. 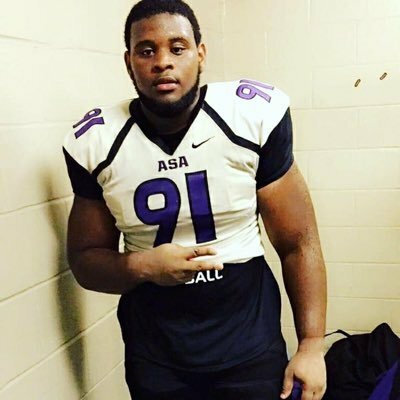 Elijah Bryant, a 6-2 290 pound DT from New York, NY has Tweeted he's received a walk-on offer from UMass. Hudl.com has video and some stats. A 4.78 40 @ 290 pounds is impressive. 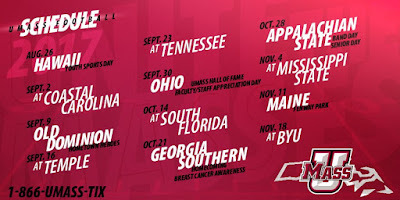 UMass announces its 2017 schedule. Nick O'Malley of MassLIve points out a schedule with nine bowl opponents is a tremendous challenge. Randy Edsell has 17 verbals so far. One reportedly chose UConn over UMass. By a razor-thin margin, Boston College moves out of the ACC's recruiting cellar. ESPN has a post on every recruits dilemma: Coach or School? P.J. Fleck, who's recruiting prowess moved Western Michigan from an 0-11 season to the top of the MAC, is doing it again at Minnesota. I blogged about Britt back on January 23rd 2016. This article talks about Britt's medical clearance to play at Arizona. Part II of the "Nine Early Enrollees Join Spring Ball". Mike Traini in yesterday's post indicates three of the newcomers are preferred walk-ons. Jake Froehlich LB 6-0 220. Froehlich was All-New England in HS and three-time Globe All-Scholastic. His Oregon bio here. Ran a 4.58 40 in HS. Spencer Goldberg OG 6-4 290. Played at Milford Academy. David Weinstock DT 6-1 287, Played for IMG Academy, from Hamburg Germany. IMG Academy has more video. UMass has announced the Minutemen will have nine enrollees in for Spring Semester and Spring ball. Matty Vautour has a post here. Mike Traini of "Fight Massachusetts" has a longer post on the newcomers here. Patrick Volcy 6-3 190 pound Safety from Naples FL. I've blogged about Volcy before. He was a 247Sports two-star player. He's also friends with Claudin Cherelus, who just verbaled to UMass on Tuesday. Alex Piechocki 6-6 260 pound DE from Attica, NY. Piechocki was not rated coming out of HS. I've blogged about Piechocki before. DaVonn Hall 6-3 315 DL. Hall was not rated coming out of HS. I've blogged about Hall before. We've been talking about how the defense struggled in 2016. These three additions fill needs on the DL and defensive secondary. Defensive linemen are the rarest recruits. Piechocki had Power Five DE size. Hopefully, he make some of those schools regret they didn't recruit him. Hall will have two years of eligibility and should be in the defensive line rotation. Volcy also has FBS size in a Safety. With Spring Ball and Fall practice he may not redshirt. Mike Ruane 6-1 220 pound LB from Rumson, NJ. I've blogged about Ruane multiple times before. Ruane is the second-highest rated UMass recruit (so far). He seems like a high-energy positive guy who could be a future captain for the Minutemen. Jaylen Larry 6-4 290 OL from Milford Academy. I've blogged about Larry before. He was a ESPN three-star player coming out of HS with two other FBS offers. 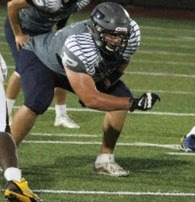 Offensive linemen do not often start as freshman, but Larry is older and he could contribute this year. Mike Curtis a 6-3 205 QB from Trinity Valley Community College. I blogged about Curtis in December. With Ross Comis out of Spring ball and likely only limited availability for Fall Camp, Curtis could be in the mix for the #2 slot this fall. All in all this is a nice group. All FBS-level players. I'll look at the three preferred walk-ons in tomorrow's blog post. Brian Roberts, a 6-0 182 pound Safety from Jacksonville, FL has Tweeted he's committed to UMass. I've blogged about Roberts before. Another three-star recruit for a Minuteman recruiting class that's starting to show some heft. Roberts had 12 FBS offers including Toledo and Troy. Hopefully he'll be part of a Renaissance in the UMass secondary. UPDATE 4:45 pm. My Dish Network sports package lists the UMass-St Louis hoops game tonight at 8:00 PM on channel 418. 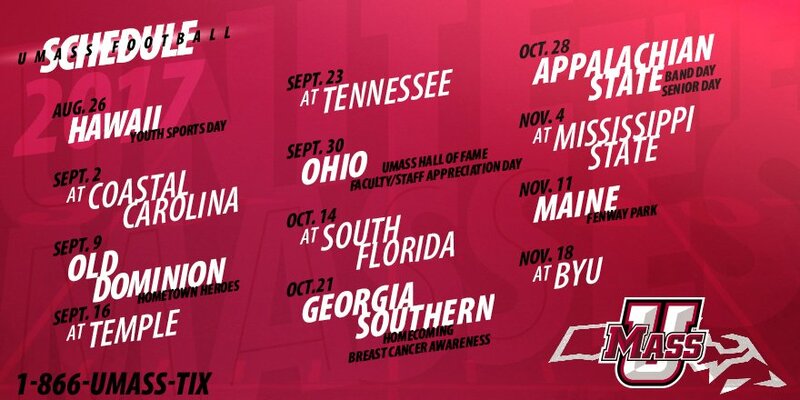 UMass will be moving its October 7th game with Hawaii to August 26th. Hawaii athletic dept notice here. This is a good move by UMass. It will give the Minutemen a bye week in the middle of the 2017 season as apposed to a 12-week marathon. Since the move to FBS the Minutemen have had mostly late bye weeks or effectively none at all in 2014. UMass will also be able to start practice one week early. As the "Week Zero" game maybe a national network will pick it up and generate some publicity for the program. UMass will have its Signing Day event televised by ESPN-3 on February 1st. Andrew Cyr of the Daily Collegian has a post on the ESPN-3 event as well as other UMass football notes. Mike Trani of "Fight Massachusetts" has a post about last weekend's official visits. David Williams, the South Carolina RB who started against UMass last Oct 22nd, will transfer to UConn. 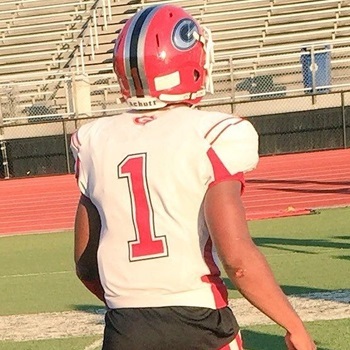 Claudin Cherelus, a 6-2 195 pound Safety has verbaled to UMass. I've blogged extensively about Cherelus before. Cherelus is a fast OLB who should play early for the Minutemen. He's a big get for UMass. 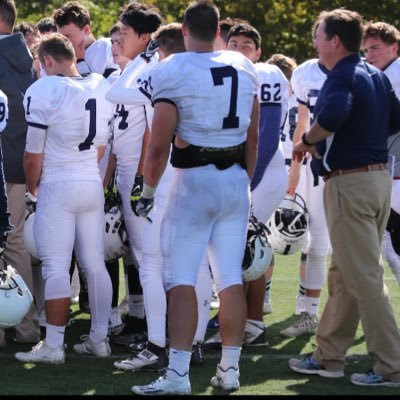 According to Mike Traini of "Fight Massachusetts" Caeleb Washington, a 6-3 260 pound DE/DT from Georgia Prep Sports Academy picked up an offer from UMass this weekend. Jacoby Herring, a 6-5 180 pound WR from Riverside C.C. in CA has verbaled to UMass. Mike Traini of "Fight Massachusetts" had a post on Herring on 01/17. Was a three-star Rival.com player coming out of HS with offers from PAC-12 Washington State as well as Colorado State, San Diego State, UNLV and Wyoming. 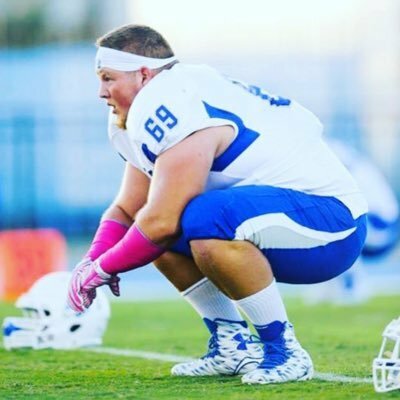 Jake Byczko, a 6-3 240 pound DE/LB has Tweeted he's verbaled to UMass. Originally a UConn commit. I've blogged about Byczko before. That's four Massachusetts recruits this cycle. 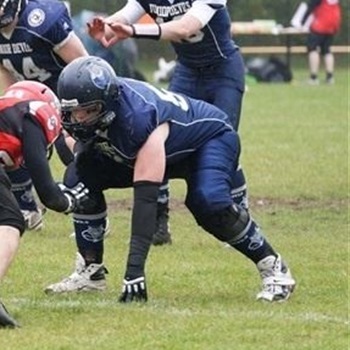 Back on January 17th, UMass offered to Gerrik Vollmer, a 6-5 280 pound OT from Germany. Played for the German state and national team. Besides UMass, Vollmer has offers from Temple and Buffalo. 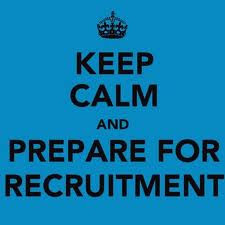 Well, the big recruiting weekend came and went and so far no muskets have been fired or other rumbles. Let's hope more is going on behind the scenes. If you missed it, Bob Diaco landed on his feet with a $825,000 contract as the defensive coordinator for Nebraska. The Power Five conference have passed the "Jim Harbaugh" rule nixing Spring Break practices in other states. On Friday, I blogged about Hunter Brown, a 6-1 270 pound DT from St. John's Prep verbaling to UMass. 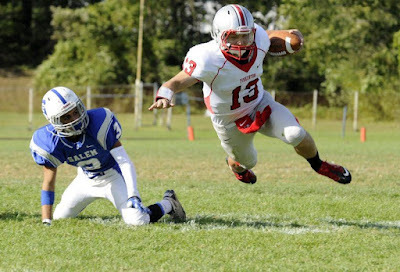 The Salem News has a story about Brown commit to UMass and some background about him. 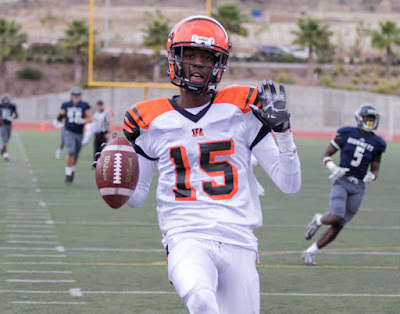 Jyvon Brown, a 6-4 190 pound pro-style QB has received an offer from UMass. This article partially features Brown. Besides UMass, Brown has an offer from Texas State. Drawing interest from Rutgers and Temple. Jaylen Tolbert, a 6-3 185 pound WR from Mobile, AL has Tweeted he's received an offer from UMass. Tolbert originally committed to Jax State. 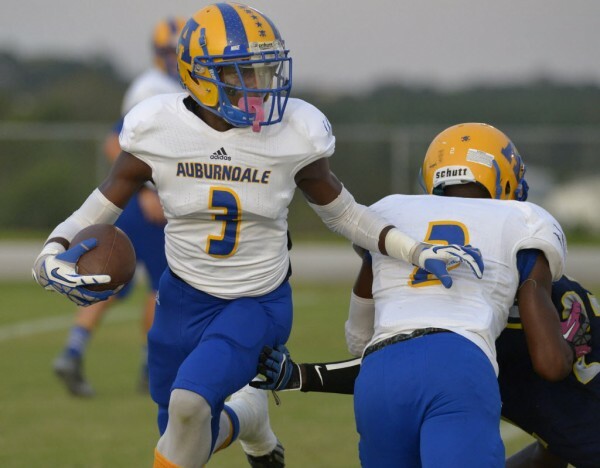 Now has offers from South Alabama and Ball State as well as the Minutemen. St. John's Prep Tweets Hunter Brown, a 6-1 275 pound DL/FB has verbaled to UMass. Massachusetts High School Coaches Association All-State Team. 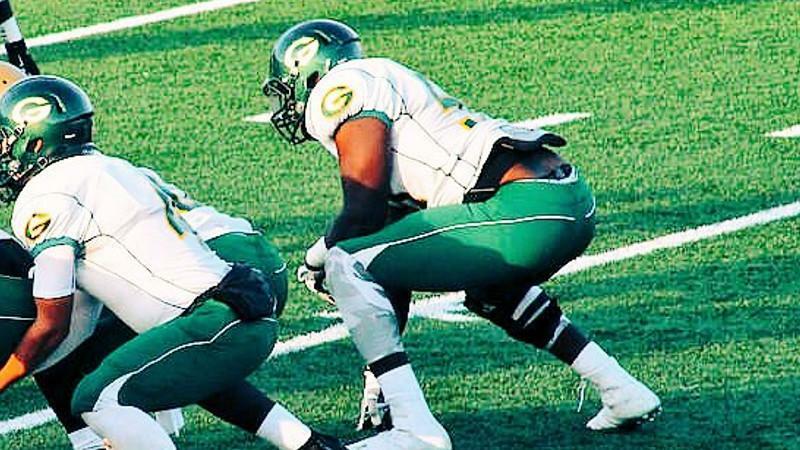 JUCO Football Frenzy reports UMass is targeting James Alston, a 6-7 305 pound OT from Grossmont C.C. in CA. "For a guy my size, I have really quick feet and I move them really well," Alston noted when asked to describe his game. "My first three kicks (kick steps) are explosive and then I have long arms, so that helps me keep guys out of the backfield and it gives my quarterback time to throw the ball down the field." Alston's journey is an interesting one. After completing a solid prep career in Hackinsack, New Jersey, Alston signed with Virginia Union, a Division Two program, but he wasn't happy there, so after his redshirt season, he decided to leave and moved out west to get a fresh start." Alston has offers from Purdue and Texas State. 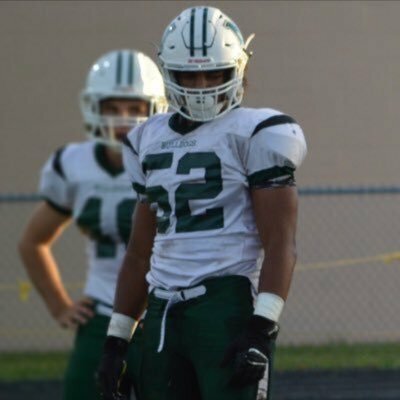 Jesse Luketa, a 6-3 215 pound OLB from Mercyhurst Prep in PA has Tweeted he's received an offer from UMass. This article from November 2016 features Luketa. Luketa holds 17 offers including BC, Syracuse, Rutgers and Pitt from the Northeast. 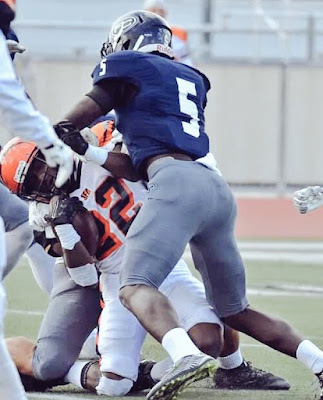 Lancine Turay, a 6-6 240 pound DE from Irvington, NJ has Tweeted he's received an offer from UMass. "Defensive end Lancine Turay, the brother or Rutgers defensive end Kemoko Turay, picked up his first offer when Syracuse extended one. The spring will be huge for Tuary, who plays at Irvington (N.J.) High and has an impressive frame. 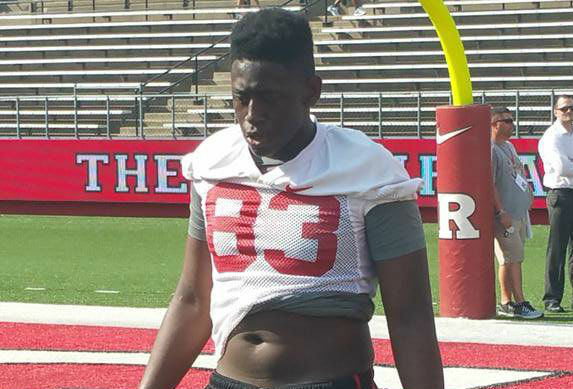 Rutgers and Penn State are also showing a lot of interest." This article from December of 2016 features Turay. Besides UMass, Turay holds an offer from Syracuse. Amir Gillis, a 5-10 190 pound Safety/Dual threat QB from Simon Gratz HS in Philly has Tweeted he's received an offer from UMass. This article from September of 2016 features Gillis. 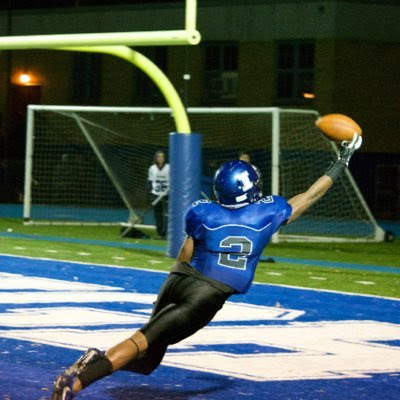 UMass is the first offer for Gillis. Drawing interest from UConn, Pitt and Temple. 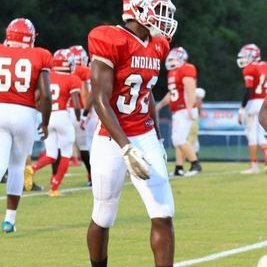 Several recruiting services indicate Tori Singletary, a 6-4 215 pound DE from Jacksonville, FL has received an offer from UMass. Partial quote from a 01/16 article by Jermy Werner on Scout.com. "I'm just going to see the see the coaches and the players," Singletary said. "Basically I just want to feel comfortable at the school." 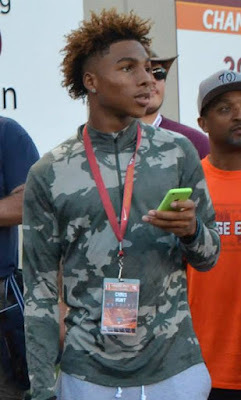 Singletary said he'll make his decision close to Signing Day." Singletary holds offers from Illinois, Troy, Tulane and Old Dominion. 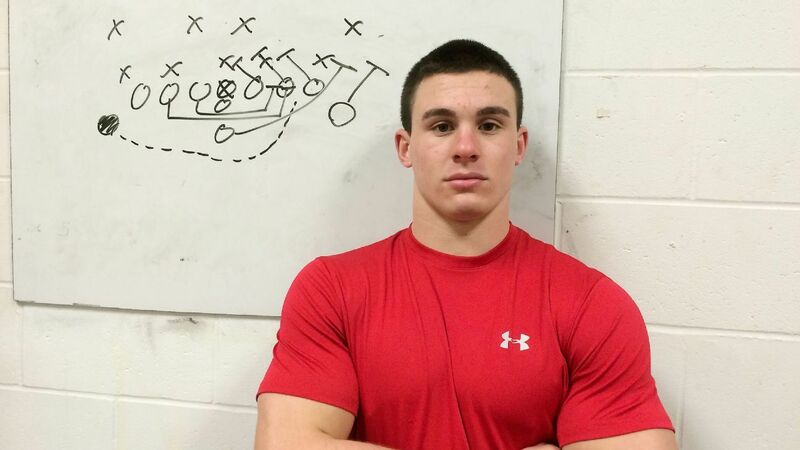 Jake Byczko, a 6-3 240 pound DE/LB from Auburn, MA has Tweeted he's received an offer from UMass. Originally verbaled to UConn. New coach Randy Edsall has been changing the Huskies recruiting class. That's engendered some negative comment. The Hartford Courant also has a post on the recruiting changes. Byczko drew interest from BC, Syracuse, Buffalo and others. Brian Roberts, a 6-0 182 pound Safety from Jacksonville, FL has Tweeted he's received an offer from UMass and will take an official visit this weekend. This August 2016 article from the MAC Blog "Hustle Belt" features Roberts. "The six-foot, 195-pounder out of Trinity Christian High School says he is projected to play safety at the next level but could also continue playing outside linebacker, providing versatility with his recruitment. "I play fast and I'm really physical," Roberts told us about his play style." Roberts has 12 offers with UMass the only one from the Northeast. Maine HC Harasymiak has a short audio interview about playing UMass at Fenway Park next year. The Black Bears went 6-5 in 2016, but three of their five losses came from two FBS teams and National Champion James Madison. College football had its highest ever average scoring in 2016. ESPN ranks Boston College #13 in an early 2017 prediction of the ACC. Giants Wire says if Victor Cruz stays with the Giants, he's facing a salary cut. 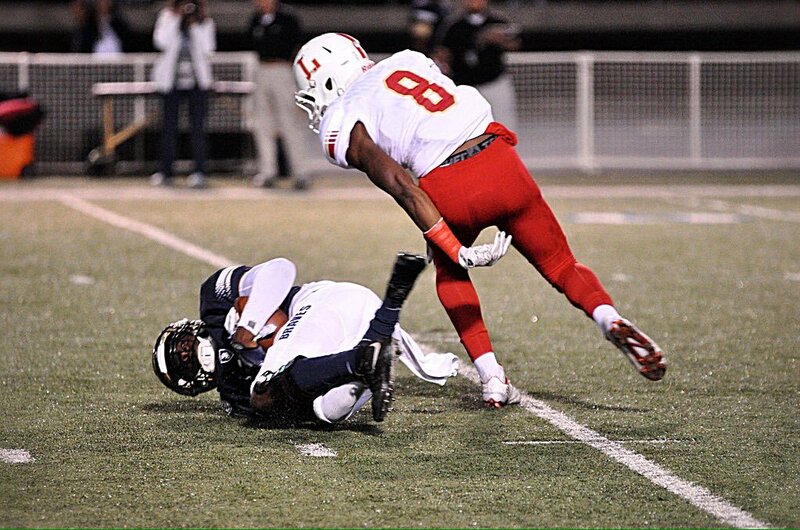 Xavier Steele, a 5-11 176 pound CB from Orange Lutherian HS in CA has Tweeted he's received an offer from UMass. UMass is Steele's first FBS offer. Rashawn Yates, a 6-4 240 pound ILB/DE from Port St. Lucie, FL has Tweeted he's received an offer from UMass. Besides UMass, Yates holds offers from Central Michigan and Idaho. 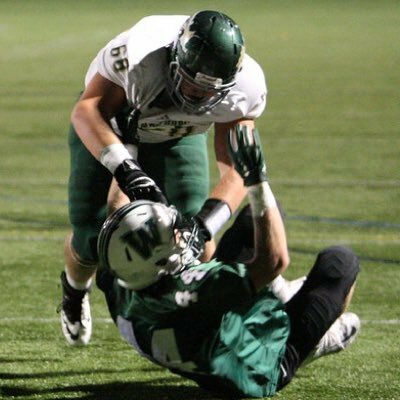 Bobby Denaro, a 6-5 285 pound DL/OL from Bolton, MA has Tweeted he's received an offer from UMass. Denaro has visited UMass during the Minutemen's Junior Day and during another visit. He holds an offer from Iowa State. UMass announces the Minutemen will play Maine at Fenway Park in 2017. The Berkshire Eagle reports the UMass-Maine game will be one of three college football games in Fenway. Matty Vautour has some more details on the Fenway game. ESPN's story about the Fenway games. The Bangor Daily News says the Black Bears think they'll have a great turnout. Matty also has a post on UMass TE Adam Breneman returning for his senior season. He said he wanted to be part of a UMass breakthrough. Victor Cruz said Odell Beckham needs to get a grip on it. The NCAA-mandated recruiting dead period has ended. We're in the sprint to finish line. Mike Traini of "Fight Massachusetts" looks at UMass' current recruiting class status as of today. The American Football Coaches Association has four changes in mind for 2017. The changes include a December early signing period and a change in the redshirt rule allowing a player to play in four games and still redshirt. PennLive.com explains what coaches can and cannot do during the "live" portion of the recruiting period. Mississippi State changes defensive coordinators. Mentions UMass' game against the Bulldogs. The Giants have several big financial decisions to make and Victor Cruz is one of them. The NY Post says Cruz would be crushed if this was the end. 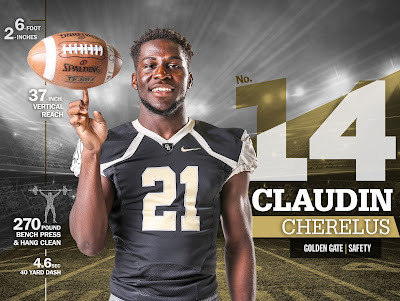 Yesterday I Blogged about Claudin Cherelus, who was one of three players to de-commit from Minnesota after a coaching change. 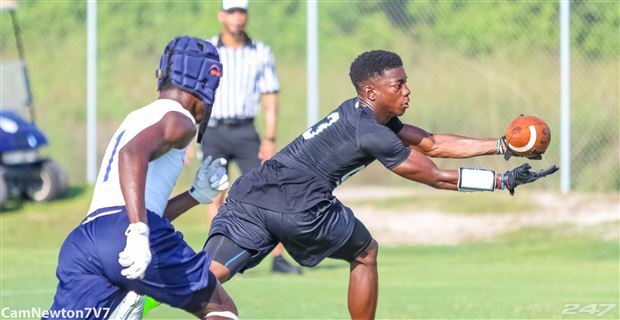 Javan Hines, another member of that group, a 6-0 183 pound WR from Tyrone, GA had received interest from UMass prior to his verbal to Minnesota, but not an offer. 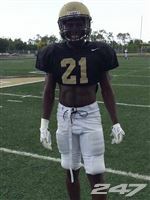 "Gophers are off to a good start with already one commitment from Georgia's Javan Hawes, who does have some position flexibility to potentially be a defensive back, but he's committed right now as a receiver and that's where I anticipate him starting his Gopher career." 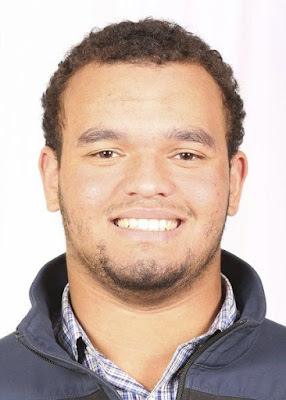 No indication so far of any renewed interest between Hines and the Minutemen, but he's now available and he fits UMass needs on both sides of the ball. Rutgers and BC schedule a series starting in 2019. Mentions BC playing UMass and UConn in 2022. Athlon Sport has the best individual football performances of 2016. Number 9 is Louisiana Tech's Carlos Henderson's near record setting torching of the UMass secondary. Boston Herald writer Howie Carr comments on the troubles at the Boston Globe. Maybe if the Globe didn't deliberately try to alienate large sections of the Commonwealth's citizenry, they'd do better. Victor Cruz hopes to return to the Giants in 2017. NJ.com reports Cruz is not retiring and wants to play somewhere in 2017. 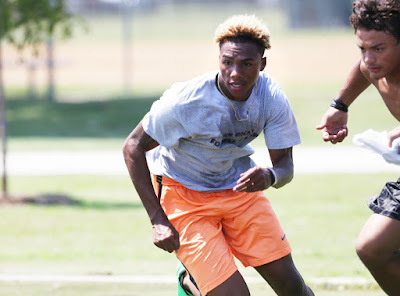 Back on Saturday, I blogged about Chris Hunt, a 6-1 165 pound CB from Virginia Beach. Mike Traini on his "Fight Massachusetts" site has a post on Hunt, which includes some quotes from him on his being recruited by UMass. Cornerback is a position of need for UMass. Recruits have a chance to play early for the Minutemen. Mike Traini has a post-2016 season review. It's well done and worth a bit of your time. It's difficult to to give a evaluation of the 2016 season, because as Traini points out, the level of competition was so high. 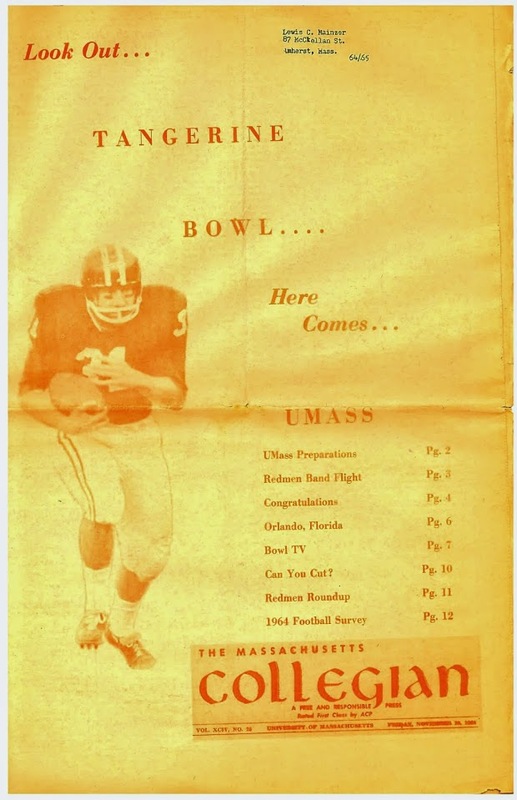 The Minutemen played 9 teams that qualified for bowls and those teams had an 8-1 record in post season. South Carolina, the lone loser, lost in overtime. Troy and Louisiana Tech turned out to be two of the Group-of-Five's top teams. Those two teams went a combined 19-5 against Group-of-Five teams. Part of the problem was we lost three impact players. In summer camp, Whipple repeatedly said Ross Comis was "our best guy" and the intended starter. Comis played well at Florida. He then got clotheslined against BC and then suffered a season ending injury at Old Dominion. His replacement, Andrew Ford actually played well for not really starting until the fourth game. Ford completed almost 61% of his passes and had a 133.99 efficiency rating. He threw three or four bad interceptions, but he was all UMass fans could ask for after stepping in. It will be interesting to see if Comis, who's game was his legs, will be effective next after a severe knee injury. Back on December 30th, I took a look at the UMass running game. Specifically, I looked at the Minutemen's effectiveness against the non-power Five section of the season. UMass finished #124 out of 128 FBS teams in rushing yards. The Minutemen did better in the Group-of-Five portion of their schedule averaging 4.16 yards a carry and 123.00 yards a game. Still, if projected over a 12 game schedule, the results would have placed UMass in the bottom 20% in rushing effectiveness. That's one area that needs more production in 2017. On defense the loss of Shane Huber and Tedrick Lowery hurt a defense that was fairly stout in its front seven. UMass has 70 TFL in 2016 a strong set of opponents had 77 against the Minutemen. DaSean Downey would start on a SEC team. He had 8.5 TFL and 6 SACKS. Downey developed pressure on the opposing QB no matter who were playing. Still, UMass got beat over the top against the likes of Hawaii, Tulane and Old Dominion. The Minutemen were #106 in passing yards allowed. That's an area that needs improvement. I believe UMass was a better team in 2016 than 2015. The strength of schedule masked a good deal of the progress. I will take off my Maroon & White colored glasses to say, even against an easier schedule, a bowl game probably was not in the cards in 2016. If we had been in the MAC a four or five win result would have been likely. I'll talk about 2017 in future posts. 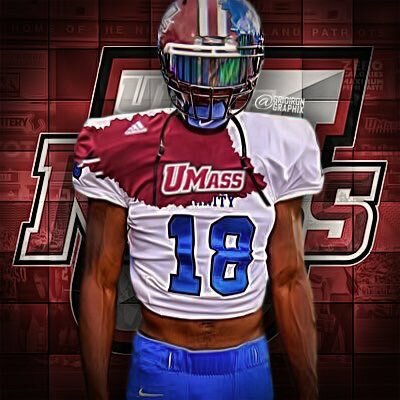 Chris Hunt, a 6-1 165 pound CB from Virginia Beach has Tweeted he's received an offer from UMass. 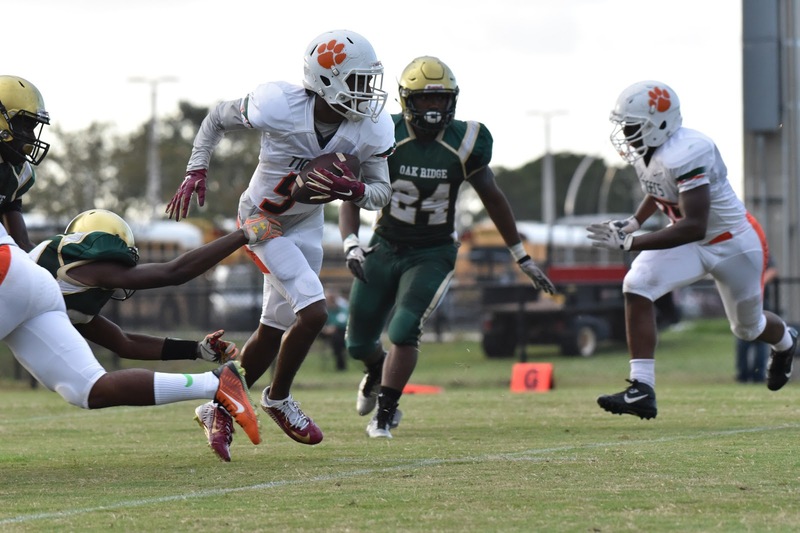 Hunt has six FBS offers. 247Sports shows he will visit UMass on 01/20. UMass LB commit Mike Ruane is in the NJ.com's First Team All-NJ defense. The US Army All-American bowl is today at 1:00 pm EST. USA Today has who's winning the US Army Bowl recruiting race. The complete roster is here. Not many players from the Northeast. The FCS Championship game is also today featuring James Madison vs Youngstown State. The game will be on ESPN2 at Noon. The Tampa Bay Times says Group-of-Five schools are investing in football. Victor Cruz, with his future with the Giants in doubt, is focused on the Packers. UMass has a post on Minutemen players making the Phil Steele All-Independent Team. You remember I linked to Steele's All-Independent Team back on December 17th. Bloomberg discusses the financial models of FBS football. Mentions UMass a lot. Note that Idaho's decision to drop to FCS cost the Athletic dept a 25% reduction in donations. UMass fans should probably be expecting the Globe's annual hit piece anytime now. They usually time it for the peak recruiting period. Charlie Strong takes over 2017 UMass opponent USF. Appalachian State announces their 2017 home schedule. Mentions UMass. Football Study Hall looks at five reasons the AAC is an up-and-coming league. The Hartford Courant says Randy Edsall nailed his apology. 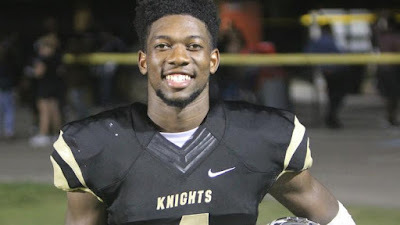 I've blogged about Dorian Jones, a 5-10 CB from Ocoee, Florida three times before. Jones reopened his recruiting after a coaching change at Georgia State. 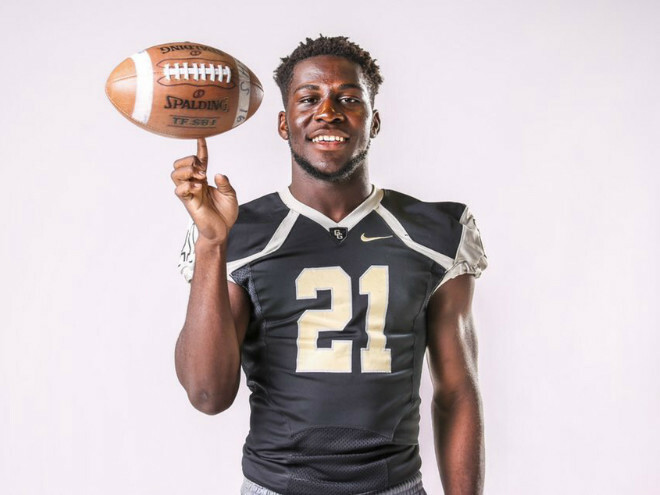 Jones had 10 offers before his verbal to Georgia State, including UMass and Buffalo in the Northeast. Three South Carolina players, including the RB who started against UMass, leave the program. Adam Breneman gets a mention in this article about Penn State lineman Garrett Sickels declaring for the NFL draft. The NY Post says five years ago Victor Cruz was the toast of the Giants nation. Cruz and Odell Beckham brush off controversy about their Miami trip. Mike Traini reports that RSFR CB Brandon Mangram is leaving UMass football. The departure of Mangram along with James Allen leaves the Minutemen very thin at DB. This could change UMass' recruiting priorities. So far, the Minutemen do not have a DB verbal. UMass may have to look to JUCO's or transfers to fill out the 2017 squad. In 2016 the Minutemen were #106 in passing yards allowed and #108 in scoring defense, so the secondary was an area of concern anyway. Multiple stories about coaching changes at the New York Jets. Marcel Shipp was one of five Jets assistant coaches that were let go. Stories here and here. I'm not sure if Shipp would like to return to the Minutemen, but if a position could be found for him, UMass football would be better for it. The UConn Blog looks at the results of coaches returning to a school where they had previously been in charge. CBS Sports ranks all the bowl games based on the actual play. Mike Trani of "Fight Massachusetts" has a post on C.J. Turner, a 6-2 170 pound WR from East St. John HS in Louisiana. This article from June of 2016 features Turner. 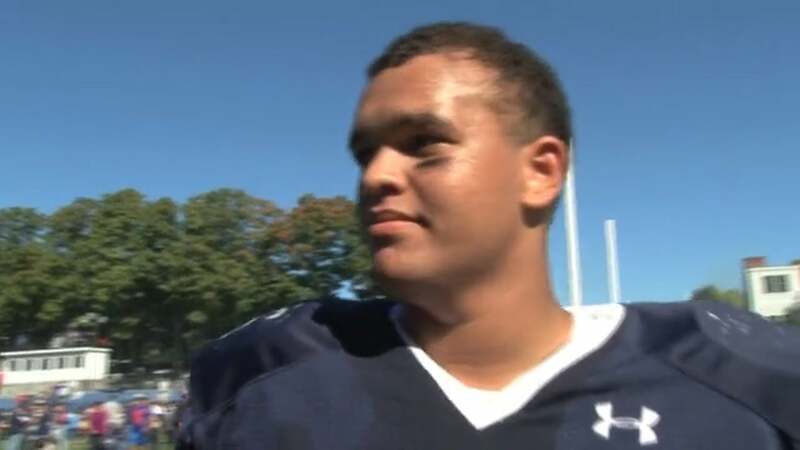 McCubreybroke two Massachusetts football records this fall. Also named to the Massachusetts "Super 26". Victor Cruz parties with Odell Beckham and Justin Beiber after the Giants win at Washington. Is it just me, or is that an odd combination? OTOH, this compilation of Cruz's Super Bowl wining season by the hip hop group Fabolous is pretty good. Florida dismantled Iowa to run UMass' 2016 opponents bowl results to 7-1. Western Michigan lost to Wisconsin to run the MAC's bowl results to 0-6. The Hartford Courant says Randy Edsall has a big job to rebuild UConn football. Mike Traini has a post in his "Fight Massachusetts" site about two defensive recruits for the Minutemen. Domenico Cipriani , is a 6-3 290 pound DL who was red-shirted in 2016. This article from June of 2016 features Cipriani. Alex Piechocki is a 6-6 260 pound DE from Attica, NY. NCSA Recruiting page has some stats. This article from 2015 features Piechocki. Wow, 2017! Time travel is possible. Penn State QB Trace McSorley, who's playing in the Rose Bowl today. had a UMass offer. Don Brown gets a big raise and a five-year contract. Brown has no fear about replacing players in his senior-laden defense. The MAC is 0-5 in bowls and undefeated Western Michigan is facing an uphill battle with Wisconsin today. NJ.com wonders what the Giants will do with Victor Cruz when the season is over. OT, but Boston College snapped a 664 day basketball losing streak. 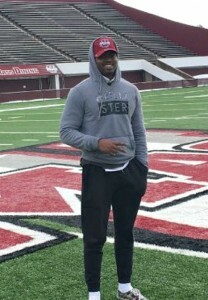 UMass is Ware's first FBS offer. 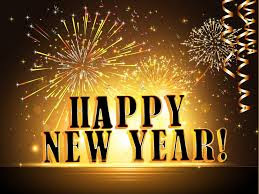 Mrs Blog and I wish all UMass football friends, family, players and coaches a "Happy New year". May 2017 bring health, happiness and peace. The first thing in 2017 I'm looking forward to is Letter-of-Intent Day. Western Michigan went from 1-11 at the start of our venture into FBS football to the Cotton Bowl on Monday. They did it with four years of MAC-leading recruiting classes. UMass, located in talent-arid New England will probably have to take more transfers and JUCO's than Western Michigan, but if they dramatically improved their talent level, we can do it too. WMU WR Corey Davis bypassed the NFL and has the Broncos in the Cotton Bowl. Western Michigan is an eight point underdog to Wisconsin. Victor Cruz wins the George Young Good Guy Award.